Diese Seite gibt es auch in deutscher Sprache. Thomas Hey'l was born in Milan, Italy, in 1960. He moved to Germany in 1972 and learned professional railroad modelling since 1983 at "Modellbahnedelschmiede Gebhard Reitz" (in Berlin). In 1985 he started an own business manufacturing parts, kits and precomposed models with prototypes of the former K.Bay.Sts.B.. The probably most popular model was the beer wagon corresponding to the prototype of sheet 422 of the 1913 index in H0 scale. 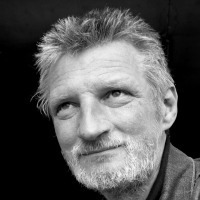 Since 1985, several articles and photographies by Thomas were published in magazines (i.e. "Eisenbahn–Journal") and books ("Das große Praxishandbuch für Hobbyeisenbahner", Willy Kosak, Interest publishing house). He regularly contributed to the magazine "Bahn & Modell" between 1988 and 1991 working with chief editor Michael Meinhold († 01/04/2009). After 1993, Thomas changed the focal point to media services. 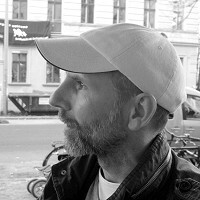 He worked as a concepter for the former Pixelpark GmbH in Berlin, where he created the overall multimedia appearance for adidas with his colleague Jürgen Semmler, cared for customers like Daimler Benz research in Berlin, Gräfe & Unzer editors (Munich) or Mustang Jeans. Working self–employed since 1997, customers like the former Neckura, Hewlett Packard, Hessischer Rundfunk, the German Consumer Ministry, Electrolux, the mobile carrier e-Plus, IZB and many others were attended, partially as subcontractor. Since 2009, Thomas works primarily as lead tester for Fremde Seite pro!vision GmbH. Thomas' main interests include accessibility and usability of websites. He has been nominated a "Top Contributor" / "Bionic Poster" at the Google™ German Webmaster Central 2009, later in 2014 at the Italian Web Search and Webmaster forums, too. [ ± ] Thomas Hey'l. Picture: Ch. Frank. The birth of Thomas' daughter (at the end of 2000) lead him back to model railroading, this time only privately and in 1:22.5 scale (narrow gauge, "G"). Scratch-build models and kitbashing are still preferred over buying. Thomas Hey'l: profile at Google+. Ronny Schmid was born in 1968 and lives in Frankfurt, Germany. He has two children. His main goals are a better design and usability in digital media - but print, too. Ronny Schmid is the CEO of the German agency "Department of Interactive Design" (phone +49 69 800856-16). While his family is his main interest, he is or at least was engaged in playing baseball, too - and successfully. One of his highlights was joining the southwest Germany regional league with the "Bad Homburg Hornets". He's almost never seen without a baseball cap. Ronny Schmid and Thomas Hey'l work together since 2002. This website is a common child of them and was brought to life for the participation at a German accessibility contest. Ronny Schmid contributed the design, the user interface and many more important details. [ ± ] Ronny Schmid. Footer with links to important pages.